Geo-Environmental undertook a combined Phase I and Phase II investigation on a parcel of land for Fareham Borough Council. The investigation was required to fulfil two main roles, namely a combined geotechnical and geo-environmental appraisal for a residential development as well as a pre-acquisition due diligence exercise. The site comprised a ground surface car park under third party ownership and thus investigation planning, health and safety assessments and access negotiations were required both with the Client and the landowner. The scope of investigation was tailored to suit the site use at the time of the investigation and minimise disruption during and after the investigation. The Client required the investigation and assessment to be completed on a rapid turnaround. Through understanding the Client’s ultimate requirements, Geo-Environmental was able to provide relevant professional and technical support in understanding and achieving the required goals to support the acquisition and development of the site. The geotechnical and contamination assessments required a detailed understanding of the site’s history, the potential impact on land quality associated with the historic use and former land uses in proximity to the site. 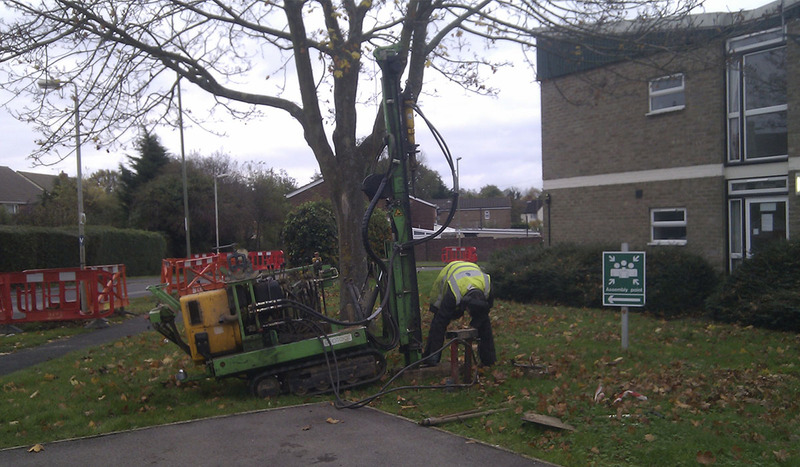 Geo-Environmental worked closely with Fareham Borough Council to deliver an investigation tailored to meet their specific requirements on this project. Geo-Environmental was able to present the assessment and a range of recommendations in a clear and concise manner to facilitate understanding and decision making by the Client in its capacity as a landowner, developer and regulator.